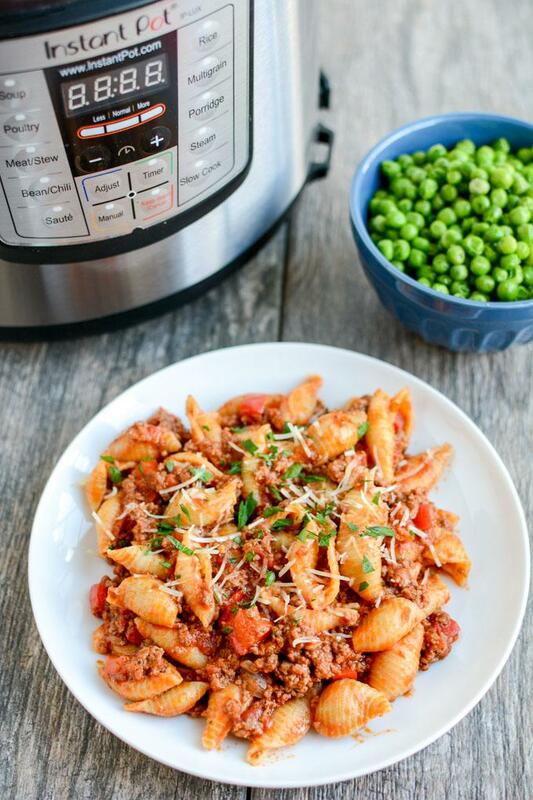 This Instant Pot Pasta with Meat Sauce is a simple, healthy dinner recipe the whole family will love! You didn’t think I’d forgotten about my Instant Pot did you? (affiliate link) I’m still using it at least a couple times of atimes a week. I even just bought a friend one as a birthday present! If you follow my weekly food prep posts, you can see what I’ve been using it for. I definitely have some favorites, like pulled pork or chicken, but I’m challenging myself to continue to try new things as well. Most recently, I tackled pasta. And it turned out so well I made it twice in one week. There’s absolutely nothing fancy about this recipe. And like usual, it can also be made on the stovetop….but I enjoyed making it in the Instant Pot because it turns it into a one pot meal. You can cook the ground meat right in the pot, then just dump in the noodles and sauce and boom! Ready to eat! Even my toddler, who almost always prefers the components of his meals separate, gobbled this up! I used ground beef but you could easily use ground turkey or chicken. And choose your favorite pasta shape. I’m partial to shells but elbows or spirals would work well too. Turn Instant Pot to Saute setting. Add garlic, onions, peppers and meat and cook until no longer pink. (optional – use ladle to remove some of the grease). Add pasta, pasta sauce and water and stir well. Be sure to stir really well so the liquid gets all the way to the bottom of the pot. Set Instant Pot for 5 minutes using manual mode. Use quick release, stir well and serve. Top with cheese or fresh parsley if desired. You can add extra vegetables. I often add carrot noodles and broccoli slaw. You can also omit the ground beef and use fully cooked chicken sausage. That’s all there is to it. Seriously so easy. If you prefer your pasta a little more al dente, you could try 4 minutes instead of 5. If you don’t have an Instant Pot, simply cook your pasta as directed and cook the meat and veggies in a skillet. Combine, add sauce and serve. If you’re feeling fancy, you could also stir in some extra veggies or some shredded mozzarella cheese. Looks so homey and comforting! It’s cold outside and this looks so warm and comforting!! I love some good meat sauce! Oh my gosh this looks great! 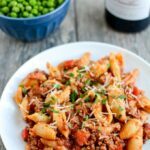 I love our instant pot but never thought to make pasta in it! One Pot meals are the best! Could you double it? I have 4 kids and half a box of pasta won’t be enough. i haven’t tried it but i think it should work just fine! Doubling doesn’t work. I tried it and got scorched sauce and uncooked pasta. Apparently if you put too much weight in the Instant Pot it thinks it has reached full pressure when it hasn’t. I always make the whole box of pasta and double the water. It comes out perfectly fine everytime. We always add a bit of extra italian seasonings and whatnots but this is one of our favorite meal in the dinner rotation. My guess is you didn’t double the water and that’s why it didn’t come out right, because I’ve made this recipe many many times, I know it will work! Oh but I don’t double the meat and everything else, just the pasta and water! I have doubled it. Works fine. Double the water! I also add a can of diced tomatoes when cooking for extra liquid h flavor. As Trang says elsewhere in the comments, you can absolutely double the water and the pasta, just don’t double anything else. It works great. I make it like that every week. I made this tonight with a gluten free pasta. Several friends of mine avoid making gluten free pasta in the IP because it doesn’t work but I had no problems. 5 minutes was too al dented for my taste so I cooked it another 2-3 m and it was perfect! This was the third meal I’ve made in my new DUO PLUS 80. The only thing I changed was to include about 6 oz. of chunked up Velvetta. Everything else the same. It was GREAT. I finally got my Instant Pot today! Your recipe is the first recipe I tried! SUCCESS! For the ground meat, I used ground Bison. 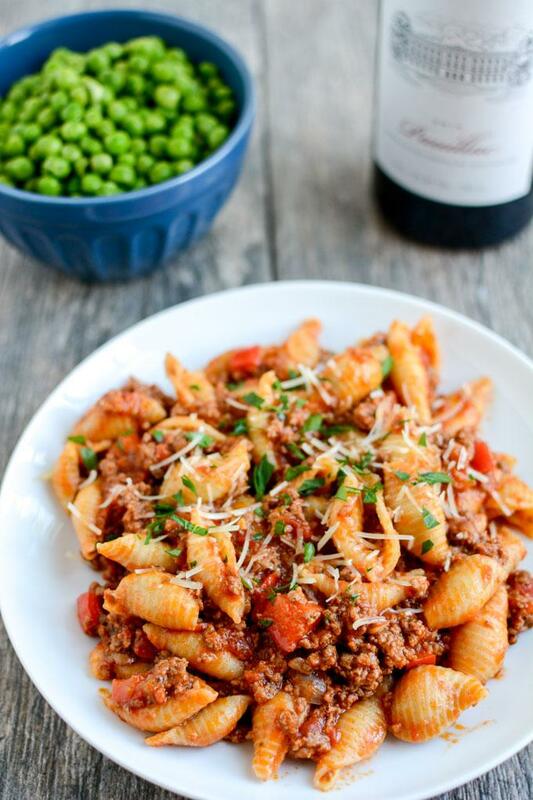 For the pasta, I used Red Lentil pasta since I am GF and it is yummy and very high in protein, This recipe is a winner. After it was finished I sprinkled a little fresh Parm and fresh basil and fresh Hot & Spicy Oregano. Thank you!! awesome! i just made this again tonight as well! so good! My husband made this. It was really quick and quite good! He sub 1/2 lb of Italian sausage bulk, added a little Italian seasoning and used the whole package of pasta, up the water to 24 oz. It came out perfect. We are instant pot newbies, and I absolutely love how quick and easy it all was… well since I didn’t really have to do anything except for washing dishes ;). I love it! Great suggestion. Did this exactly and now I’m making it for the 2nd time in a week. Thank you! Can you use cubed chicken? I made this dish the other night for my husband and his buddy; they loved it so much! My husband said this is now his fav. Dish. I am making this again tonight. Loved it! Came out perfect. Made as directed and will make again!. Have had the Instant Pot for 2 days and it’s already paying off in spades! hmmm I’m not sure. I just made it again myself this week and it worked. I’ve had success with both wheat pasta and chickpea pasta. Did you follow the recipe ingredients exactly or did you make any modifications? First time IP Duo user here. and tried making this recipe. I got the “burn” message reading across the screen doh! hi! So mine has never said that…but two things i’d try. After you cook the meat on saute, try turning it off and letting it cool down for a few minutes before you hit manual and set the time. Also, make sure you stir it really well after you add the sauce and water so some of the liquid gets down to the very bottom! You might need to add more liquid so you don’t get that Burn message. I’ve had my IP for only a month and a half or so, but have made this meal twice! So, so flavorful! Tonight, I used leftover halves of a red and green pepper. The green pepper added a nice texture. Also, I stirred in some frozen green peas (after the pressure was released) and let them heat up for a few minutes. Delish! First time making this. Followed recipe exactly and it was delish! Any chance of a nutrition breakdown for a diet App? sorry! i don’t have it but you could put it in yourself! It would be nice to know what setting on the insta pot to use after you saute. Could I use frozen ground beef? I think you’d have to thaw it partially in the microwave so that you could break it into chunks and then you could use the saute function to cook it in the instant pot. Loved this recipe for the instant pot – thank you! Husband & 2 year old loved it too. Can I use ground turkey meat instead? That’s what I’ve used twice now and it’s fantastic! Made this tonight and my hubby kept saying good, wow, this is really good! The kids loved it, too! I used 1 whole box of whole wheat penne pasta, double the ground turkey, kind of eyeballed the sauce and water, and prayed that it would work! Thank God it did and it was delicious! yay! so glad to hear it was a hit!! great idea on the peas! glad to hear it was a hit! If I got pre-minced garlic(read it wrong), can you tell me about how much is 2 cloves worth? Thanks! Does this same recipes and amounts work with the 3quart Instant Pot? i’m not sure. I’ve never tried cooking in one that small and it might make it too full. Sooo good! Thanks for this! I’m new to the IP so of course I forgot to make sure the vent was closed, once I heard it going off I cancelled, quick released, opened stirred and then started it over with the vent closed this time. Still turned out great! I didn’t have peppers though. I think I’ll try and hide in some other veggies for my boys next time. Hi, I do not have an instant pot but I have a pressure cooker. Would I need to adjust anything for this recipe? Thank you! honestly not sure. you’d probably want to look at the manual and see what their directions are for cooking a pasta type dish. It should work, I’m just not sure on the timing. OMG so so good. Perfect recipe! Thank you for posting.